Glass and ceramic cooktops are slowly becoming a popular option in the modern kitchen today. The smooth cooktops not only give your kitchen a more modern look and feel, but also double up as a counter and worktop in a small kitchen. 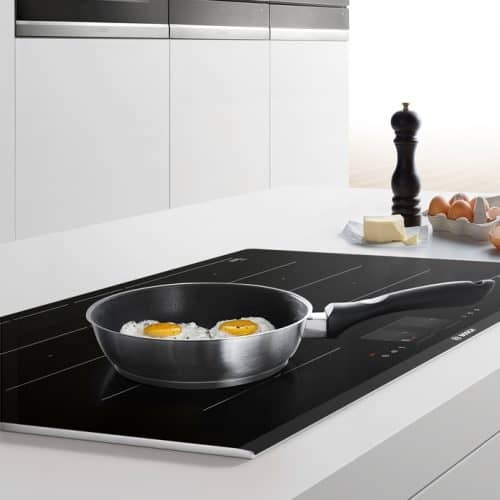 Another advantage of investing in a quality ceramic cooktop in your home is the fact that they are relatively easier to clean than tradition models or gas burners. While an all-purpose cleaner will come in handy when cleaning fresh spills and stains from the cooktop, failure to do this regularly and on time can tarnish the otherwise shiny surface. For this reason, proper maintenance and cleaning are required to avoid the accumulation of food residue that can damage a polished surface. A dirty ceramic stovetop is not only unsightly but can also become a health hazard for everyone in the house. We’ve put together a few tips and steps on how to keep your cooktop clean. To do this, you will need some baking soda, soapy water, white vinegar, and a damp cloth. 1. Sprinkle baking soda on the cooktop, ensuring the entire surface is covered. You can use a container with tiny holes punched through to make this easier and help get an even distribution of powder on the cooktop. 2. Using a spray bottle, spray a small amount of white vinegar on the baking soda – the vinegar should be just enough to get the baking soda bubbling. The bubbling effect will start working on dirt and stains on the cooktop, making it easier to clean even the toughest of stains. 3. Soak a dishcloth (or two) in warm soapy water for a few minutes. Be sure to use a large enough cloth to cover the entire cooktop, and wring out any excess water. Next, lay the damp towel over the bubbling baking soda, a wait for 15 minutes. This should help loosen any food materials and stains on the cooktop making the cleaning process even easier. 4. Use the damp towel to wipe off the baking soda from the cooktop. It’s best to use circular motions when wiping the contents away, so that residue on the stovetop can be scrubbed off easily and without much effort. Rinse the cloth clean with water, wring it again, and continue to wipe off the remaining residue off the surface. Once this is done, you can then allow it to air-dry or use a dry microfiber cloth to remove any remaining water. Burn marks call for a different approach. To remove these, you will also need a silicone spatula to help scrape off the stain. Once done scraping, you can then make a baking soda paste and smear the using a sponge over the burned area. Cover the paste with a damp cloth for 30 minutes, then wipe it away. Cleaning tough stains off ceramic cooktops can sometimes to be a challenge. If baking soda and the silicon spatula don’t seem to work, you can switch to a more serious chemical solution such as Cerapol. These chemicals are specially formulated products that can help clean tough stains with ease. All you need is sprinkle the solution on the stain, leave it for a few minutes, and wipe it off. This should leave your cooktop sparkling clean without abrasions or causing damage. You never have to wait until the cooktop starts tanning to clean it. Regular cleaning is recommended to help keep the cooktop clean and shiny throughout its life. One of the best ways to do this is by cleaning stains and other debris as soon as they happen. Leaving a stain to sit too long on the cooktop only makes it harder to clean. While some of the high-end cleaning solutions may help clean this, baking soda and vinegar should do the trick. If you are looking to replace your kitchen cooktop, or are in the market to upgrade to a ceramic top, Brisbane Appliance Sales have a large range of state of the art cooktops from some of the worlds leading brands. Contact us today or come and visit our Brisbane showroom to find the perfect cooktop for your kitchen.